Baby-Safe Night Light The safest ABS and PP materials contain no harmful substances and make for a night light that’s 100% safe for your toddler to play, cuddle, and grow with! Even the LED filters blue light so you and your child can use it securely for longer without straining your eyes. Must-Have Extra Features Emitting a soft, dim glow the built-in night light mode allows you to discreetly check on your baby or breastfeed without waking up your husband. A double tap on the logo sets a 1.5 hour timer that comforts your toddler to sleep and turns the lamp off automatically afterwards. 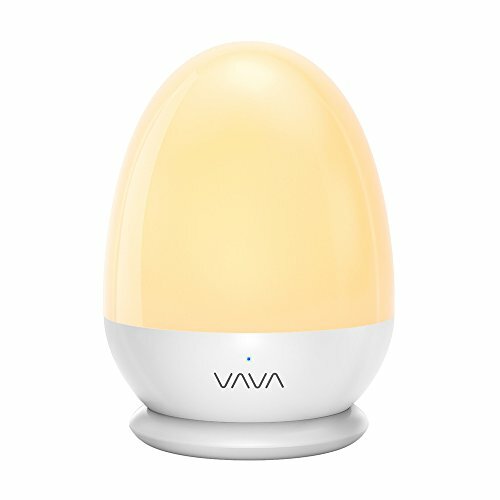 Convenient Charging Base Don’t worry about recharging the VAVA Night Light, all your kids need to do is place it on the anti-slid charging base and voila. If you’re taking the lamp with you, simply connect the Micro-USB cable directly to charge when out of the house. Customizable Light An improved, rechargeable battery provides up to 200 hours of dimmed illumination, or 6 hours at the brightest settings. For outdoor usage there’s a Portable Mode that boosts the brightness by 30% and disables touch control to prevent accidental manipulation. Indoor & Outdoor Usage Who knows where you’ll need a light! The IP65 build is waterproof so the baby night light can double as a bright lantern when camping, trekking, or hiking with family. One button away is a SOS mode in case you or your children need to communicate your position. What's In The Box: 1 x VAVA Baby Night Light (Model: VA-CL006) 1 x Charging Base 1 x USB Charging Cable 1 x Carabiner1 x User Guide.